Synopsis: Three different plots in three different cities namely Angola, Kerala and Mumbai are intertwined with few of the employees of the Greater Boston Global Bank (GB2). In Angola a covert CIA agent is about to exchange weapons for blood diamonds whereas in Kerala an elderly man will do whatever it takes to fulfil a promise made to dying son. And in Mumbai an international bank is stunned by the mysterious deaths of its key employees. Bankers build their careers on trust, or so everyone thinks, till a series of murder rock the GB2 putting it’s reputation at stake. Who is behind these killings? What is the motive? Is the banker at GB2 fast turning into a bankster? Or was he always one? In this maze of puzzles, questions and murders the John Grisham of banking takes us through a gripping thriller in the quest of solving those puzzles, questions and murders. Review: The book cover bears the tagline ‘Meet the John Grisham of Banking’. 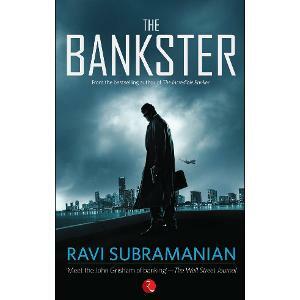 So when Ravi Subramanian is referred as the John Grisham of banking the expectations from the book gets doubled even though I have never read any of his previous publications. So with much expectations and excitement, I started reading the book. There are three stories set in three different cities with a prologue on things happening in Angola and Kerala. The main plot is in Mumbai whereas the other two parts are smaller although forming an integral part of the story. The pace is set and there is not a single dull moment in the entire read. The easy narration and style of writing coupled with use of Hinglish makes it a comfortable read. Not even for a once you feel like taking a break from reading, it’s that interesting with unpredictable twists and events gripping you page by page. The climax is the best part of the book for me as it is even more gripping with lots of twists and turns leading to answers from the maze of puzzles. For once the facet of corporate life mentioned within the plot which exists not only in the banking sector but almost everywhere seems so real and can relate to. The book is a must read for some edge of the seat thriller as it has all the ingredients for it. It is highly advisable to read it at one go to understand the plot and characters better else have to flip over the pages again for better understanding on the plot. There are slight glimpses of poor proof reading noticed which could have been easily avoided. But overall, The Bankster is simply an entertaining thriller not be missed!! This review is a part of Book Review Programme at BlogAdda.com. Participate now to get free books! NextWe are there for You!